As I was studying for a lesson last week, I came across a reference in Wikipedia to something I have never heard of. And boy, did it spark my imagination! After further research, I concluded that, yes, it is a common notion in Rabbinic tradition. David Asscherick broke down the arguments well. I’ll sum them up. The foot of God’s Throne is made of a blue stone. In Exodus 24, Moses and the elders of Israel are invited up Mt Sinai to seal the covenant with God. They eat and drink. Moses alone may approach God, but the elders get a glimpse of Him from afar. 9 Moses and Aaron, Nadab and Abihu, and the seventy elders of Israel went up 10 and saw the God of Israel. Under his feet was something like a pavement made of lapis lazuli, as bright blue as the sky. God cuts the commandments from His throne. In this setting, God presents the hard copy of the covenant the Israelites have verbally committed to. The way the word stone and tablet are written in Hebrew leads the interpreters to believe that God is referring to a specific stone. And the only stone in this context is the blue stone of God’s throne. In Exodus 32, we learn God made the tablets and wrote on them Himself. The color BLUE has special significance for Israel. God directed Israelite men to wear blue tassels on their garment. Why? Read in Numbers 15. 39“It shall be a tassel for you to look at and remember all the commandments of the LORD, so as to do them and not follow after your own heart and your own eyes, after which you played the harlot, 40so that you may remember to do all My commandments and be holy to your God. The blue thread was to remind them of God’s Law, the blue commandments. Its kind of an interesting idea, don’t ya think? We, no doubt, would get so much more out of Scripture if we would do indepth research and study. Interesting, Kay! I never quite noticed that verse (Ex. 24:10) – the reference to the stone, particularly. I HAVE loved a couple of verses down where it says the elders “saw God, and did eat and drink.” Such a casual reference – amazing! One question: On the second set of tablets, verse 4 of chapter 34 says that Moses “took in his hand the two tables of stone” when he went to MEET God, inferring they had already been carved and ready to be written on. Do the Jewish experts believe that sapphire stone was prevalent enough for Moses to carve it from this BEFORE arriving at the throne of God a second time? Also, verse 5 says the Lord met with Moses in a different way; this time he descended and STOOD with Moses, proclaiming the name of the Lord, almost as if the throne of God was not present the second time? It’s a cool concept to perceive the law of God coming directly from His throne, though. Would also be interesting to know how difficult it would be to write on sapphire versus some softer stone – I have no idea. Ex. 34: 27-28 seems to say that, ultimately, it was Moses who did the writing of the second tablet; however, verse 1 does say God told Moses He would write them. Thanks for sharing – got me to wondering about the descriptions of heavenly things – mostly described in colors and character of precious stones – cool! Eating and drinking is the common way to seal a covenant. So, the covenant God made was ratified between the representatives of Israel and God. As far as who wrote on the second set, I’m guessing God wrote the 10 again, and Moses added the portion God gave him in chapter 34. Rabbinical tradition says that only the first set had a mysterious and supernatural property: the words were bored completely through and the little portions of the letters (“jot and tittles”) floated in their correct spot inside the letter. No matter which way the tablet was held, you could read the words correctly. They flipped when you flipped the stone. 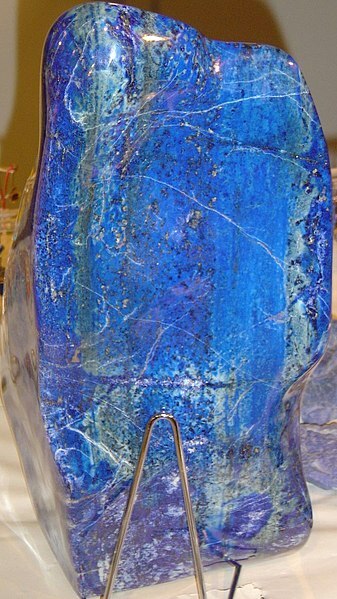 I wondered about where Moses got the second set of lapiz lazuli as well. There must have been enough of it on top of the mountain! Just heard about the 10 commandments being written on sapphire by Perry Stone his take on this is the land is high in aluminum and when the hand of God or fingers wrote the commandments that super heat produced sapphire. Either way I think this is confirmation that they were on sapphire and when you included the bible verses in Exodus in there it sealed it for me. Sorry for the Necropost, Rabbinic tradition states that God put the tablets under his tent so he could dig them up. Neil, Exodus 34:1 says, “And the Lord said to Moses, ‘Cut two tablets of stone like the first ones, and I will write on these tablets the words that were on the first tablets which you broke.” Deuteronomy 10:2, 4 Also clearly states that God wrote on the second set of tablets as He did the first. Here God tells Moses to hewn the tablets out of stone. Evidently Moses hews them out of stone at the bottom of the mountain, before he goes up onto it to meet with God, because this scripture says that he up into the mountain with the tablets in his hands. I would have to question Jewish tradition, because I don’t believe that the stone at the foot of the mountain is the throne of God. Perhaps it was lapis lazuli (blue stone), as that semi-precious stone, though rare, was available in that region. As faithful as the scriptures are to detail, I would also have to question why they don’t mention that the stone tablets were made of a special kind of stone. In Exodus 34:1-4 it is also recorded that Moses hewn out the stone tablets, rose up early the next morning, and carried them up onto the mountain with him. As for the Talmud and Jewish tradition in general, I don’t put much stock in them. Although some of it may be historically accurate, much of it is tall tales and even mixed with the occult. Practically all orthodox rabbis are versed in and actively practice the ancient Jewish witchcraft of the Kabbalah (Cabbala), which is the origin of the so-called “Star of David” that is prominently displayed on their state flag. The star has nothing to do with David and is more accurately known as the “Seal of Solomon” and is used to conjure up spirits, just as the hexagram is used in rituals for other types of witchcraft. I am a believer in the new covenant which states that God will write His law in our minds and upon our hearts (consciences). Jesus fulfilled the requirements of the law without sin, and because of that He condemned sin in the flesh and overcame sin. He came so that He might fulfill the righteousness of the law within us. We don’t have to try and keep the letter of the law by the strength of our own flesh. If we submit to Jesus and forsake our sin, He will fulfill the law within us by the Holy Spirit and give us the power to overcome sin as He did. All we have to do is resign ourselves to the fact that we can’t do it. We cannot keep them in the flesh. That is why the Old Covenant failed. Only Christ Jesus through the Holy Spirit can do it in us. We have to be one (or abide) with Christ, just as He is one (or abides) with the Father. I believe that we are obliged to keep the commandments through Christ Jesus, but as for whether the tablets that the original commandments were written upon were made of sapphire stone from God’s throne or not, well, I just don’t see the connective evidence that proves that they were. Just a thought here. It is possible that Moses cut the second table of Stones out of God’s throne right after the conversation that takes place in Exodus 33:21 instead of after he gets to the top of the mountain? Moses is asking to see God’s glory. God’s says you can’t see my face and live but goes on to say “There is a place near me where you may stand on a rock. When my glory passes by, I will put you in a cleft in the rock and cover you with my hand until I have passed by.” Just a couple verses later he is asking Moses to: “Chisel out two stone tablets like the first ones, and I will write on them the words that were on the first tablets, which you broke.” Could it be possible that cleft in the rock is in God’s throne, perhaps in the very place where the two sets of commandments were carved from? Also, most covenants were ratified or sealed by blood. Once ratified, nothing could be added or taken away from the covenant. The life is in the blood and often you were putting your life on the line when making a covenant. The Old Covenant was ratified by the blood of an ox, but the New Covenant was ratified by the blood of Christ as the Lamb of God. The night before Jesus died on the cross He introduced the doctrine of the communion supper. He offered up the bread as a symbol for His body that was yet to be broken and the wine (of the unfermented variety) as a symbol of His blood that was yet to be spilled. Why didn’t He wait until after He had been crucified and resurrected to introduce that to His disciples? It was because it was necessary for it to be introduced before the covenant was sealed in blood. Otherwise, it could not be a part of the doctrine of the covenant. I would argue that baptism and foot washing were also given as part of the covenant doctrine before it was ratified by blood. In addition to being blue they were probably also rectangular. They are usually depicted with rounded tops because writing tablets in the middle ages were shaped like that. Wow, I wonder!! This is really quite amazing. Thank you so much for this article. Concerning your comments on the blue stone being made from pieces of God’s throne, I don’t see how that would be possible since it was too dangerous for him to possess them physically. My point is this…..When Moses came down and got angry when he saw what they were doing He cast them down breaking them……..in doing this it would have equated or spiritually insinuated that God’s THRONE had been cast down but it is only satan’s throne that has and will ever be cast down…….sounds like Jewish fables we were warned about in Titus and 2 Peter…..We must remember it is essential that the scriptures be discerned spiritually………. From looking at many comments…God shine and light is His righteousness and therefore Moses and all Israel could not stand this as they are men who are sinful. But do you notice that as Moses goes to God more and more he shines more and more. The communications or closeness of Moses to God the father translated his approval of Moses and therefore he could see God not face to face but nearer to Him. Do you know that blue stone are found in the mountains on the original mountain in Madina in Saudi Arabia. The current Mount Sinai is not the original where God presence was and therefore does not have sapphire stone but at mountain ranges of Madina which the Saudi Arabia would not permit any digging of this blue stone because they believe the place is holy and they have tonnes of oil anyway. So yes.. among this mountain ranges is where Moses met God. That’s cool! I’ve never heard of that. Thanks for sharing. Michelle, I totally agree. This is a Midrash interpretation. It is completely uninspired and I beleive some want to adopt this view because they need Scripture to be more than it is. and why would God bring stone from heaven only to have Moses broke them. Something God would have already known before hand. Besides if Moses didn’t break them, they people would have worship the stone themselves rather than God! The idea isn’t so much that God “brought it from heaven” since we don’t really understand the logistics “where God is from.” God doesn’t need to “bring” anything. But you can extend the argument to the throne, why would God need to bring his throne in Exodus 24:10 to Sinai? There are several requisite facts… the pavement is a component of his throne not merely some random thing on which his throne may or may not sit. In virtually every vision or revelation of God’s throne there is a blue glass, blue sea, or blue sapphire pavement on which it sits. It is one in purposeful existence the very throne of God. Second, the simple fact is that the Exodus Text explicitly states that God’s fully revealed presence was somewhere near the summit of Sinai which means he was above the 70 elders so they were literally looking upwards through the “pavement” at the presence of God. The term “pavement” means “tiles.” This is unlike the other texts where we see the blue “glass” around God’s throne but in this context it is absolutely vital to understanding the first “tablets.” If they were in fact blue as the ancient records of Israel suggest, and square, and since it was upon the moment when God visited the elders at the ratification of the book of the covenant, that it was a piece of the very pavement of his own throne upon which he inscribed the very laws on which the covenant was based. This is no small matter either since the single most important article in the Tabernacle was not the mercy seat, but rather the first item mentioned – the Ark of the Covenant. What resided in it? The stone tablets. The size of the ark of the covenant is also intriguing. It is perfectly sized to hold 2 – 1x1x1 cubit objects with a small amount of room on one end for a few other small objects. Midrash suggests that Moses gathered up the pieces of the first tablets and then cut out of stone the second tablets. If both sets were in fact in the ark then they ONLY could have been 1x1x1 for each pair. If the Talmud is correct when placed back to back they made a perfect cube. 1x1x1 cubit. A picture of the trinity. It is exactly the same cubical nature as the New Jerusalem according to The Revelation of Jesus Christ. That leads to another impressive fact, since the first tablets were not broken at the time God gave Moses the dimension of the Ark, the prescribed size allowed (foreshadowing the actual events) two sets of tablets. I take from that God’s full understanding of both broken and whole, failure and redemption even in the very ark of the covenant. Finally the last item of importance is the color. The idea is that the tiles of the pavement of God’s throne are blue according to Scripture. In any number of contextual studies of the tabernacle inevitably colors and metals are a component of how we interpret each item. Some have said that blue means sky, the Holy Spirit, divine authority… yada yada. However, if sapphire blue means the righteous law of God, on which his throne is established, one of the most important colors of the tabernacle is revealed. The three colors coded into the veil and the curtain are Blue – God’s perfect legal righteousness, Scarlet red is a picture of blood, and Purple – the blend of blood and law. The whole thing is a picture of redemption from sinfulness back to God’s righteous requirement through blood… which ultimately was a picture of the sacrifice of the Messiah. So in the end, after the tabernacle was erected. God’s throne the mercy seat still resides on the blue sapphire pavement, broken by man, redeemed by God. The curtains show righteousness, blood, and redemption, the priest is dressed in all blue who comes before Him. Thank you. What a beautiful explanation. Thanks very much for this article . Dear Matt ,God didn’t gave Moses that tablets to be broken but Moses did after seeing what Israel nation did in his absence and that why God asked Moses to made the same as the first Exodus 24:1 and Moses did as God said. Found a great article in “Jewish Times” that addresses this very subject. This interpretation is directly from the Midrash, a mystical interpretation of the Torah. So if you want to get into Kabbalah, go right ahead. The translations for the blue stone are, in some versions, lapis lazuli, and in others, sapphire. Which one would be more reliable, and why? You can look into that issue via commentaries, and word studies and be sure to look at the LXX to see how they interpreted the earlier text. As I understand, either word is a viable translation. Acts 5 Ananias: means God’s grace tents among us and Sapphira means The Law on the lapis lazuli. The New Covenant cannot mix with the Old Covenant. When Jesus said, “It is finished” it was. The demands of the law for anyone who believes are totally paid in full. The lord would not permit the deceitfulness and attachment of Ananias and Sapphira to mix with the grace of God. Their deaths signified that there would be no mixing of the two covenants, forever! The law of the Spirit of life has set me free from the law of sin and death. The Law came by Moses, but grace and truth came by Jesus Christ. I like that you believe Jesus was born in September. I think so too. But, its a bit far-fetched to think heaven is on the planet Saturn, not to mention unscientific. Lapis lazuli has long been known as “stone of heaven.” — the word lapis being Latin for stone (cf. lapidary) and lazuli (of Persian origin from which the word “azure” [cf sky blue] deriives). The sky (heaven) is blue. The laws were written on a stone natural to earth, symbolising the perfect character of God in Jesus who became fully vulnerable and human. If the law was written on God’s pavement stone, Moses and all the machinery in the world could not break it. The second set of stones were carried up to the mountain by Moses, as some have pointed out, so they were not cut at the top of the mountain. The blue sapphire stone story is an embellishment favoured by many, but it is not scriptural.